There’s no point in competing against UFC welterweight champ Georges St-Pierre in a popularity contest, so Josh Koscheck isn’t about to try. In fact, he’s content with being the least liked kid on campus, just as long as he’s stacking chips at the same rate he’s collecting Octagon wins. “I wouldn’t say that I’m a bad guy. It seems that way in the arenas, but when I’m walking through the airport or at dinner, that’s never the case,” Koscheck said during Tuesday’s UFC 124 press conference. “I have fun with this. I’m here to have fun, I’m here to make money and I’m here to win fights. 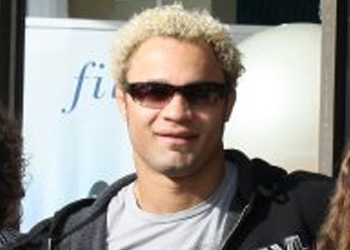 Koscheck emerged on the mainstream scene as a contestant on the first edition of “The Ultimate Fighter.” After a five-year hiatus, Koscheck returned to the popular reality show this season to coach opposite GSP. Although Octagon brass rewarded Kos by serving him up to the king in his own den, MMA’s ultimate antagonist wouldn’t have it any other way. “It was a great honor to coach on TUF against Georges. It’s going to be a fun fight here in Montreal. This place is going to be packed and it’s probably going to be the loudest crowd in the history of the UFC,” Koscheck expressed. Without a doubt, the 32-year-old will be public enemy numero un when he enters the Bell Centre in GSP’s backyard of Montreal, Quebec, Canada. That’s why Koscheck didn’t bother mucking up his mind with a complicated game plan for the planet’s nastiest welterweight. “When I go into a fight, I want to knock my opponent out and put on a great performance,” he emphatically stated. “If the fight presents itself, I don’t mind winning by decision. I don’t mind winning by submission. I just want to win this fight. I’m coming here well-prepared. Our neighbors to the north will host their showdown at UFC 124 on December 11th.